A couple of months ago, I reviewed the new Caribou Coffee Sparkling Teas and Juices which I enjoyed. I was recently contacted to try the new Caribou Coffee quiches. They come in two different kinds: ham and cheddar and spinach and swiss. I had the week off work for vacation and since we were not going on any major trips, Troy and I decided to live it up in our own area. We went out to eat a lot and decided to bike to Caribou Coffee to try these new quiches. I ordered one of each for us to split and a coffee with a shot of caramel. One thing that I love about Caribou Coffee is that they have real plates and cups for you to use if you are going to eat there. My husband and I chose to eat outside which was really nice. Ham and Cheddar: Filled with eggs whipped with sweet cream, country ham and a blend of cheeses are folded in and baked until golden brown, all wrapped into a flakey pastry crust. Spinach and Swiss: Tender spinach, a mix of Swiss and Parmesan cheese, lightly seasoned with pepper and nutmeg, and baked into a classic egg and cream custard, with a flakey pastry crust. 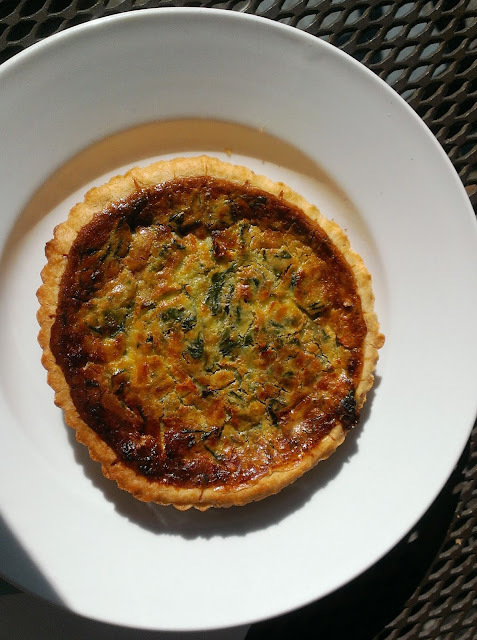 Each quiche has 360 calories which is not too bad if that is your entire breakfast. Each quiche was quite small which I was surprised about. The flavors were both excellent and the quiche tasted fresh. Troy and I both preferred the ham and cheddar quiche but the spinach and swiss was good as well. 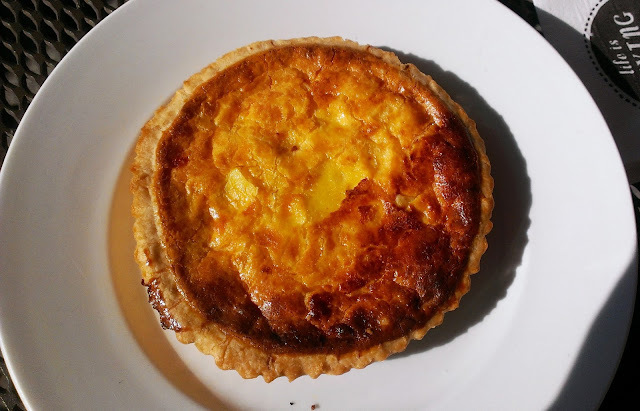 Each quiche is in a pastry pie crust which of course has a lot of calories and fat. This is a decent option but some healthier choices from Caribou Coffee are their oatmeal such as the blueberry almond oatmeal and the spinach, egg and swiss mini.